"As everybody already knows, Roberto has decided to part ways with the band in order to start his solo career. We wish him all the best and we thank him for the long walk we have had together. At the same time "the show must go on", as somebody said, and the good news is that we have started working on the new album. 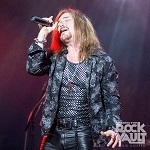 This is not the only good news, anyway, 'cause we are incredibly excited and honored to announce that our new singer is none other than a top-notch artist and a piece of history in the metal world: we warmly welcome Mr. Mark Boals on board (Yngwie Malmsteen, Ring Of Fire, Royal Hunt) and we can't wait to let you all listen to some of the new songs we are working on!